The Layla 25 inch vanity combo presents a sleek and attention-grabbing profile that will make your bathroom "The Room" in your home. A pristine white finish and dazzling blue glass hardware please the eye while the solid wood frame, dovetail joint construction, and soft-close glides and hinges testify to quality craftsmanship. Layla's uncluttered panels allow the beauty of its design and construction to shine through, and the combo comes with a carrera white marble top and oval undermount sink. A matching mirror and linen tower allow you to create a complete design palette. Let Layla bring your bathroom to life. The Allie 25 inch vanity combo brings to you good looks and generous storage. An uncomplicated design scheme gains luster from the sophisticated Twilight Gray finish with matte gold trim and hardware. A solid birch wood frame, plywood drawer boxes, dovetail joints, a convenient toe kick, and soft-close glides and hinges testify to the quality of construction. The vanity combo includes a carrera white marble top and retangular undermount sink. A large open shelf provides ample storage. The Austen 61 inch vanity combo is simple yet stunning. The Austen Collection features a minimalist design that pops with colour thanks to the refined Twilight Gray finish with matte gold trim and hardware. The vanity combo features a solid wood birch frame, plywood drawer boxes, dovetail joints, a toe kick for convenience, soft-close glides and hinges, carrera white marble top and dual rectangular undermount sinks. Complete the look with matching mirror, mirror cabinet, and linen tower. A perfect choice for the modern bathroom, Austen feels at home in multiple design settings. Add understated elegance to your bathroom with the Delano Collection. Spare in style, we designed Delano to accent a range of bathroom dicor, blending simple beauty with unmatched versatility. Whether you choose the Taupe Glaze or White Finish, the 36-inch Delano features a durable solid wood frame and sophisticated black bronze pulls, 1 flipped down DWR and 2 functional DWRs. The combo includes a durable carrera white marble top and rectangular white vitreous china sink. Layla 25 inch Vanity Combo in White with Carrera White Marble Top The Layla 25 inch vanity combo presents a sleek and attention-grabbing profile that will make your bathroom "The Room" in your home. A pristine white finish and dazzling blue glass hardware please the eye while the solid wood frame, dovetail joint construction, and soft-close glides and hinges testify to quality craftsmanship. Layla's uncluttered panels allow the beauty of its design and construction to shine through, and the combo comes with a carrera white marble top and oval undermount sink. A matching mirror and linen tower allow you to create a complete design palette. Let Layla bring your bathroom to life. 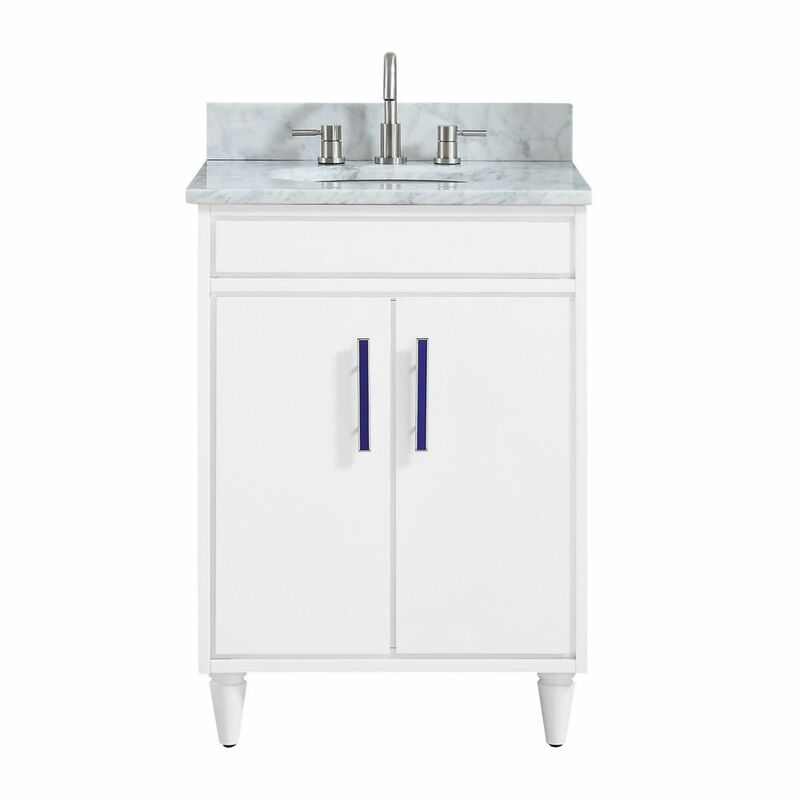 Layla 25 inch Vanity Combo in White with Carrera White Marble Top is rated 5.0 out of 5 by 1. Rated 5 out of 5 by Joe from Great vanity. Spacious inside and the marble top and backsplash... Great vanity. Spacious inside and the marble top and backsplash look great. Shipping took a long time, but it was consistent with the estimate provided.